The younger daughter is a teenager. She is athletic and has always enjoyed sports. Her first passion was volleyball, although she played basketball, too. She would love to have played volleyball throughout her school career, but in middle school she was sidelined by pars stress fractures of the lumbar spine, which effectively benched her for volleyball and basketball. Thereafter, she took up golf and played on the high school varsity team for two years. Other than volleyball, she has not found her passion in other things. She has done some cross-stitch, humored me by learning to knit, took a rigid heddle weaving class, crocheted a bit, did some needle-felting, and even took a spinning class with me yesterday (along with two awesome friends), but none of these things really caught fire with her. This summer, she is enrolled in a photography class at one of the universities in San Antonio. She also begins calligraphy lessons this week in Austin. With both things, I am beginning to see a spark of genuine interest in her, and it thrills me. While she is an excellent cook and makes the most divine macaroons I have ever had the delight to consume, she is not wild about cooking. In contrast, I cannot remember a time in my life when I was not actively crafting something. My mother embroidered the edges our pillow slips with fine silk. As a child, she tried to teach me embroidery, but counted cross-stitch made more sense and stuck. From there, I did needlepoint for years, even designing my own canvases. Following a house fire brought on by a lightning strike, I lost thirty years of cross-stitch and needlepoint, as well as my desire to ever do it again. It was then I picked up knitting and ran with it. 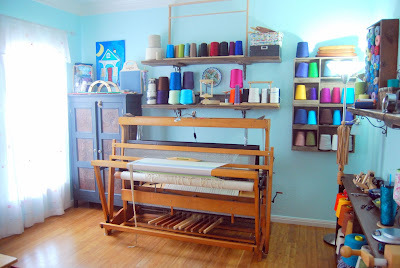 Thereafter, a knitting friend introduced me to weaving by bringing me an extra loom she had purchased from an auction to help a woman who had been diagnosed with cancer. 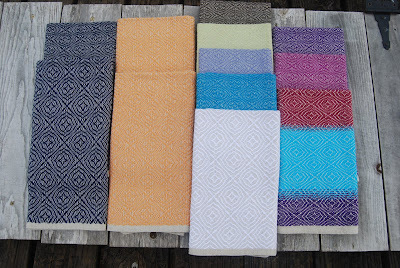 As she dropped it off, the friend smiled and said: "You need to learn how to weave, so you can teach me." Little did I know what a wonderful favor she would give me by introducing me to the world of weaving. In a society in which we, particularly women and most particularly young women, are constantly barraged with images and ideals of perfection (long legs, ample bosoms, slim waists, smooth and creamy skin, doe eyes, etc. ), it is often hard to find our way and our place in the world. It is most difficult to measure up to these paragons of so-called beauty. While I have never considered myself a beauty queen (or a drama queen, for that matter), I have been confident in my abilities to do things, create things, and take care of those I love. Cooking, crafting, and working have all helped me to gain that confidence. Fortunately, I have also had a passion for each of those things, which has made the doing of them all the more enjoyable. However, I freely admit that not all crafts are for everyone. Yesterday, my daughter, two great friends, and I descending upon the Loom Room in Comfort, Texas to take a two-hour spinning class. One friend has her own Kromski wheel. None of the rest of us had ever touched a wheel. The owner/instructor had a Kromski and a couple Schacht wheels for us to use. The nicest wheel was a Schacht Matchless, which another friend of mine recommended as her favorite wheel. In an effort to set the daughter up for success, I elected for her to spin on that one. I chose a Schacht Sidekick. My wheel had issues from the beginning. It made noises when I treadled, and then the bobbin and whorl fell off, twice, as I was trying to spin. 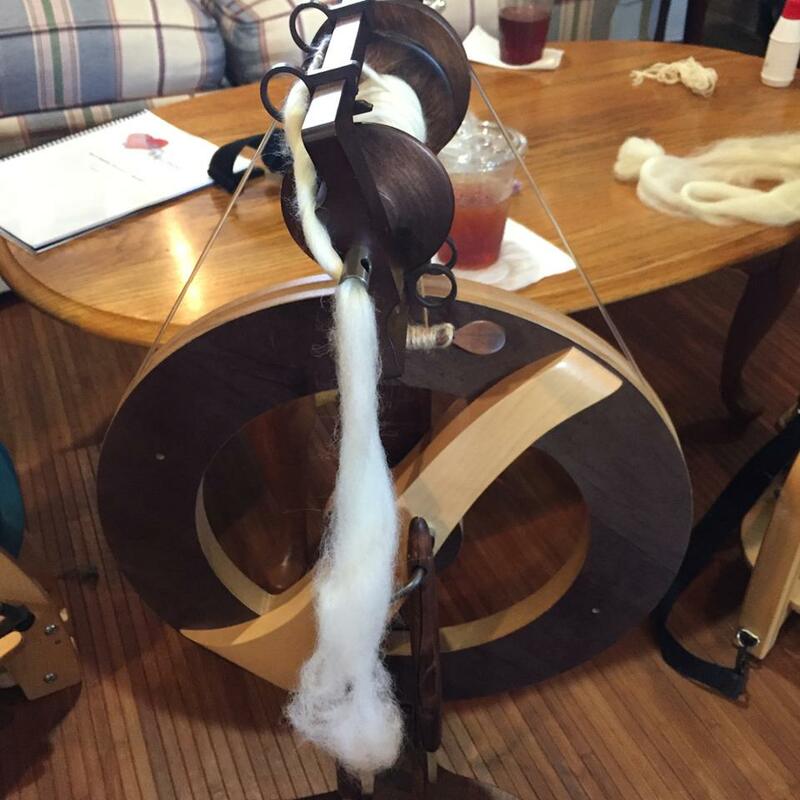 It did not take me long to discover that as much as I love crafts involving wool, spinning is definitely not in my wheelhouse (see what I did there? Ha!). The daughter and the other ladies were studious and diligent in their efforts. They did GREAT! As I have no spun wool to share, I borrowed this photo from what one of my friends did yesterday. I taught myself to knit when I was 13. During life's trials knitting has been my comfort zone. Helen, You are exactly right! Good for you!